Innovative articles, fresh ideas: in one of the best scientific journals of Russian Academy of Sciences, in English. Major innovations, discoveries explained in 1-to-3-line annotations. The area of science: ecology, environmental science, water quality, water safety. Paradigm-shifting articles published in a unique scientific journal. Topics: environmental sciences, ecology, ecosystems, water quality. ISSN PRINT: 0012-4966. ISSN ONLINE: 1608-3105. Availability: All of these papers are available online via the Internet service Springerlink. Almost all of the libraries of the major U.S. universities have the paper copies of this journal. Explanation of the title of the journal: the word ‘Doklady’ in Russian means ‘Reports’ or, in this context, ‘Proceedings’ or ‘Research communications’. This word came from the Russian title of the best scientific journal ‘Doklady Academii Nauk’ which means ‘Proceedings of Academy of Sciences’ or ‘Research Communications to Academy of Sciences’. This journal is indexed by Web of Science and PubMed. The Concept of Aquatic Biota as a Labile and Vulnerable Component of the Water Self-Purification System, Doklady Biological Sciences, vol. 372, no. 2, pp. 286-289, in English. Author: Ostroumov, S.A.
New Definitions of the Concepts and Terms Ecosystem and Biogeocenosis. – Doklady Biological Sciences. A closely related paper: A new set of criteria in order to answer the question was formulated in this paper: is a given chemical substance hazardous to environment or not? Reference: Ostroumov S.A. Anthropogenic effects on the biota: towards a new system of principles and criteria for analysis of ecological hazards. – Riv. Biol. (Rivista di Biologia) 2003, 96(1):159-169. Review. An aquatic ecosystem: a large-scale diversified bioreactor with a water self-purification function. – Doklady Biological Sciences, 2000. Vol. 374, P. 514-516. The Synecological Approach to the Problem of Eutrophication. – Doklady Biological Sciences, 2001, v. 381, No. 1-6; pp. 559-562. Ostroumov S. A., M. P. Kolesnikov. Pellets of Some Mollusks in the Biogeochemical Flows of C, N, P, Si, and Al. – Doklady Biological Sciences, 2001, v. 379, p. 378-381. New Definitions of the Concepts and Terms Ecosystem and Biogeocenosis; – Doklady Biological Sciences, 2002, v. 383, No. 1-6; pp. 141-143. On the Biotic Self-purification of Aquatic Ecosystems: Elements of the Theory. – Doklady Biological Sciences, 2004, v. 396, No.1-6; pp. 206-211. Inhibitory Analysis of Regulatory Interactions in Trophic Webs. – Doklady Biological Sciences, 2001, v. 377, No. 1-6; pp. 139-141. Ostroumov S. A. The Hazard of a Two-Level Synergism of Synecological Summation of Anthropogenic Effects. – Doklady Biological Sciences, 2001, v. 380, No. 1-6; pp. 499-501. A New Type of Effect of Potentially Hazardous Substances: Uncouplers of Pelagial–Benthal Coupling. – Doklady Biological Sciences, 2002. v.383, No. 1-6; pp. 127-130. Imbalance of Factors Providing Control of Unicellular Plankton Populations Exposed to Anthropogenic Impact. – Doklady Biological Sciences, 2001, v.379, No.1-6; pp.341-343. The first discovery of the negative effect of the synthetic chemical pollutant (surfactant) on filter- feeding of zooplankton, and negative effects of the chemical of water filtering: Vorozhun I. M., S. A. Ostroumov. On studying the hazards of pollution of the biosphere: effects of sodium dodecylsulfate (SDS) on planktonic filter-feeders. – Doklady Biological Sciences, 2009, Vol. 425, pp. 133–134. The journal: ISSN 0012-4966. It is the first paper in which it was clearly shown that aquatic biota (the sum of organisms) is the core part of the ecological mechanism of water self-purification in healthy aquatic ecosystems. The important attributes of this core part of the mechanism are: 1) lability; 2) vulnerability to anthropogenic impact. The author formulated a new fundamental concept of the complex of organisms of aquatic ecosystem. According to the concept, the biota is a central, labile and vulnerable (to pollutants) part of the ecological mechanism of water self-purification and upgrade of water quality. Self-puriﬁcation of water is a complex process including physical, chemical, and biological components [1–3]. The vulnerability of different components of the water self-puriﬁcation system to anthropogenic factors is as yet insufﬁciently understood. The goal of this work was to review the literature and our own unpublished experimental ﬁndings concerning potential vulnerability of the biotic component of the water self-puriﬁcation system to chemical pollutants. 2) synecological summation (a new scientific term) of man-made effects. Effect of Amphiphilic Chemicals on Filter-Feeding Marine Organisms. – Doklady Biological Sciences, 2001, v.378, No.1-6; pp.248-250. ISSN 0012-4966, © Pleiades Publishing, Ltd., 2010. Translated from: Doklady Akademii Nauk, 2010, Vol. 431, No. 4, pp. 566–569. An Amphiphilic Substance Inhibits the Mollusk Capacity to Filter out Phytoplankton Cells from Water. – Biology Bulletin, 2001, v.28, No.1; pp.95-102. Aquatic ecosystem as a bioreactor: water purification and some other functions. – Riv. Biol. 2004, 97(1): 67-78. A new set of criteria in order to answer the question was formulated in this paper: is a given chemical substance hazardous to environment or not? Anthropogenic effects on the biota: towards a new system of principles and criteria for analysis of ecological hazards. – Riv. Biol. (Rivista di Biologia) 2003, 96(1): 159-169. Review. It is a first paper in which a synthesis of both authors new experimental data and international literature was made, which led to a new broad picture of the role of biological filtering in self-purification and self-bioremediation of aquatic ecosystems. The first paper that reports experiments that showed that all three main kinds of synthetic surfactants (detergent chemicals) slow down the filtration of water by marine organisms, filter-feeders (bivalve mussels of the Atlantic Ocean, Mytilus edulis). The 3 main types of surfactants that were studied were representatives of the 3 classes: anionic, cationic, and non-ionic surfactants. Ostroumov S.A., Widdows J. Inhibition of mussel suspension feeding by surfactants of three classes. – Hydrobiologia. 2006. Vol. 556, No.1. P. 381 – 386. DOI: 10.1007/s10750-005-1200-7; Indexed in Web of science. Ostroumov S.A. 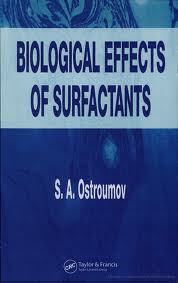 Biological Effects of Surfactants. CRC Press. Taylor & Francis. Boca Raton, London, New York. 2006. 279 p.
Some aspects of water filtering activity of filter-feeders, From the issue entitled “Aquatic Biodiversity II“; Indexed, Web of Science. DOI: 10.1007/s11184-005-0095-x; Indexed, Web of Science. Suspension-feeders as factors influencing water quality in aquatic ecosystems. In: The Comparative Roles of Suspension-Feeders in Ecosystems, R.F. Dame, S. Olenin (Eds), Springer, Dordrecht, 2004. pp. 147-164. A detailed well-structured presentation of the author’s innovative and multifaceted conceptualization of how almost all aquatic organisms work together toward making marine and estuarine water clear and clean. Generalizations presented in this paper represent, in systematized form, the basic elements of the qualitative theory of water self-purification in freshwater and marine ecosystems. Recommendations are given for maintaining water quality and sustainable development of water resources. Results of experimental studies of the effect exerted by the surfactant Triton X-100 and the synthetic detergent OMO on freshwater bivalve mollusks Unio tumidus. Translated from: Izvestiia Akademii Nauk SSSR, Seriia Biologicheskaia, (4), 1991, p. 571-575. Response of test-organisms to water pollution with quaternary ammonia compounds. – Water resources (1992) [ISSN 0097-8078] Vol. 18(2), p. 171-175; Translated from the Russian original articles: Vodnye Resursy, v.18 (2), 1991, p.112-116. Available in the U.S.A., Canada. Key innovative books, papers: ecology, environmental science. More than 100 publications, more than 200 libraries. Author Sergei OstroumovPosted on March 8, 2013 October 9, 2013 Categories UncategorizedTags aqua-farming, aquaculture, aquatic ecosystems, biogeochemistry, biotesting, bivalve mollusks, chemical pollutants, detergents, discoveries, Doklady Biological Sciences, Ecology, ecosystem health, ecotoxicology, environmental chemistry, environmental toxicology, freshwater ecology, hydrobiology, innovations, invertebrates, Marine Biology, Moscow University, phytoremediation, phytotoxicity, synthetic surfactants, toxicity, water purification, water quality improvementLeave a comment on Innovative articles, fresh ideas: in one of the best scientific journals of Russian Academy of Sciences, in English. Major innovations, discoveries explained in 1-to-3-line annotations.